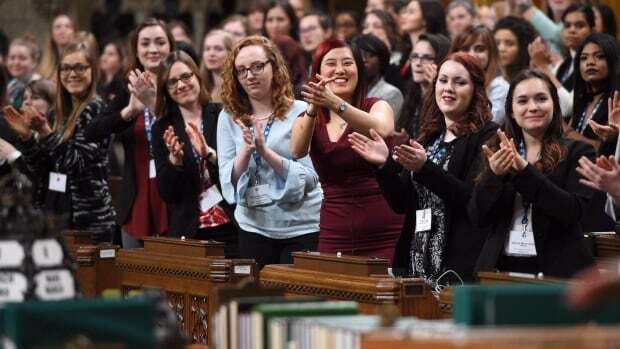 A House of Commons committee is making a cross-party call for the federal government to offer financial incentives to political parties that nominate more women candidates to run for election. “Despite their growing political participation, women represent just 35 per cent of all legislators in Canada and remain under-represented at all levels of government,” the report said. The committee zeroed in on the role that political parties play, saying they should work harder to get more women to run by eliminating sexism and biases that might be built into their recruitment efforts. One potential fix, the committee says, would be to offer cash incentives, such as subsidies, to encourage parties to help more women get nominated and then elected. Witnesses and experts who spoke to the committee cited New Brunswick’s example of changing the formula for the per-vote subsidy to favour female candidates in provincial elections. Votes received by female candidates are weighted 1.5 times greater than votes received by male candidates in the province, which encourages parties to run women in competitive ridings where they are more likely to win. The federal per-vote subsidy was eliminated in 2015. The government must now respond to the report. Gender Equality Minister Maryam Monsef’s office has yet to respond to a request for comment. Studies looking at the issue have found that when party members are given the option to vote for female nominees, they often do. In addition, early and long nomination campaigns are more likely to attract female contestants, the committee heard. “Women may benefit from increased transparency and accountability in nomination and election campaign processes, as this would confirm that all candidates are subject to the same rules,” the report says. The committee said Ottawa should also consider encouraging parties to set voluntary quotas for how many female candidates they plan to field and publicly report on efforts to recruit female candidates after every general election. Other recommendations include a call for publicly funded education campaigns and training to counter the negative effects of gender-based harassment of female politicians, both in traditional and social media. The committee also said Statistic Canada should get more funding to expand its data collection on the participation and engagement of diverse groups of women in political activities. The MPs who worked on the report plan to ask to another Commons committee, which studies electoral issues, to consider looking into ways to eliminate gender bias in the design of voting ballots. A letter would also go to House Speaker Geoff Regan to ask him to examine ways to eliminate gender-based heckling in the House of Commons.